Members were given one of these at the start of the year. We are to look after it and bring it back at the December 2016 meeting (the annual Pot Luck) for comparison. 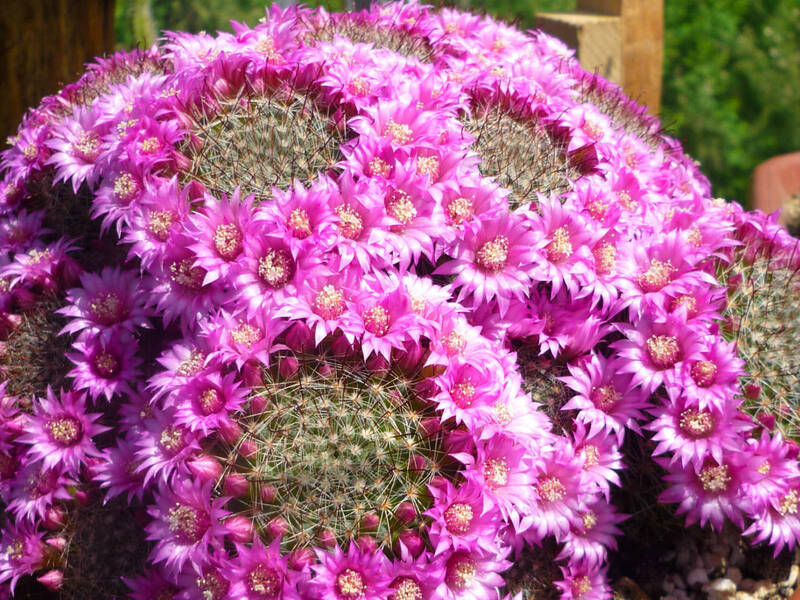 Most of the plants distributed have rosy-purple flowers whereas some have white flowers. 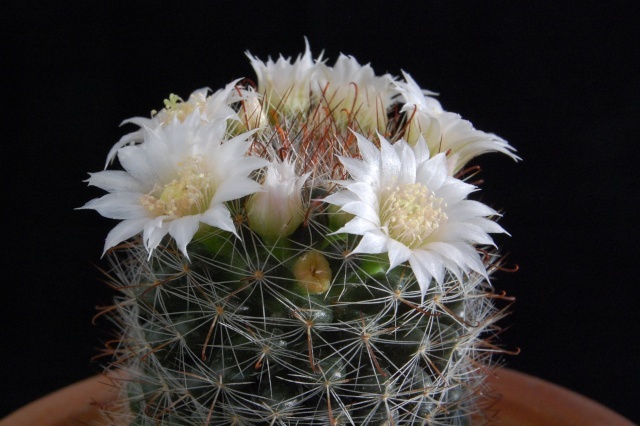 It will be interesting to see next year if there is any correlation between the flower color and other elements of their appearance, such as the coloration of the spines or the amount of white down. Endemic to Guanajuato, Mexico. It was rediscovered near San Miguel de Allende in Cañada Virgen in 1987 (Fitz Maurice 1988). The range is less than 1 km², it grows at elevations of around 1950 m.
Grows in a very restricted area in a narrow passage with sheer volcanic rock, large trees and flowing water offered shade and humidity in an otherwise very dry environment. Its roots grow in the thin layer of moss and fern growth that covered the lower, shaded vertical rock that formed the canyon side. Clump forming soft bodied glossy green globular or columnar stems up to 5 inches (12.5 cm) tall and up to 3 inches (7.5 cm) in diameter. Prominent oval tubercles arranged 13 to 21 around the circumferance with 4 reddish central spines (the upper 3 straight, the lowest hooked) and clusters of soft hair-like 15 to 18 white radial spines, they can be pubescent (downy). 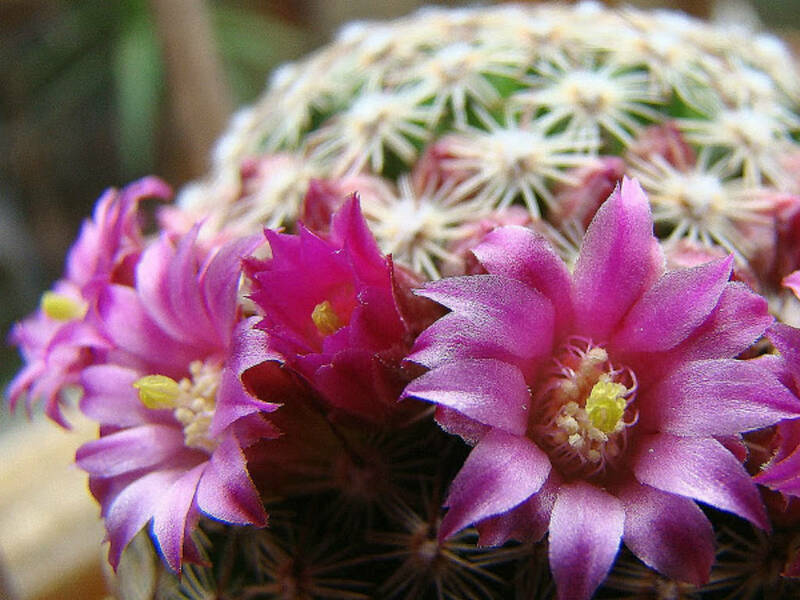 Rosy-purple or white funnel shaped flowers with yellowish stigmas usually forming a ring near the top of the stem. 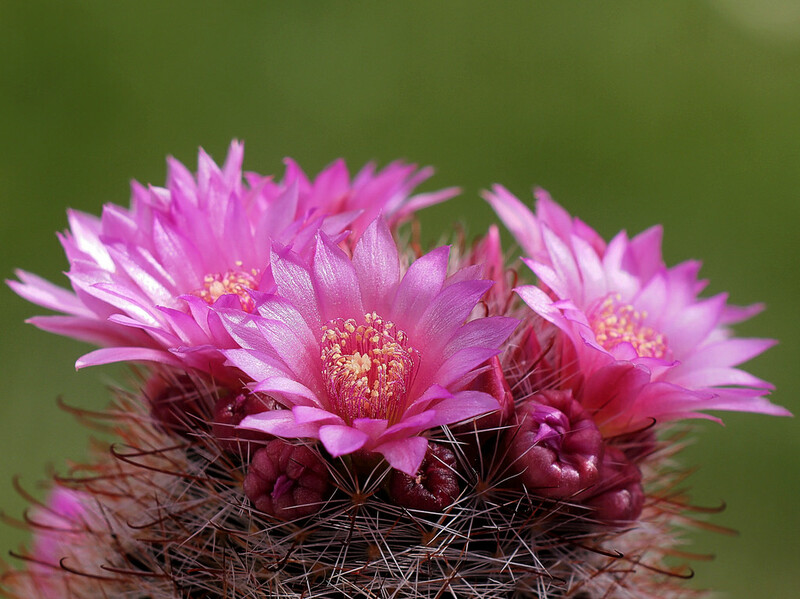 Flower rings are present most of the year. The fruit is whitish green to pale pink and the seed is black. 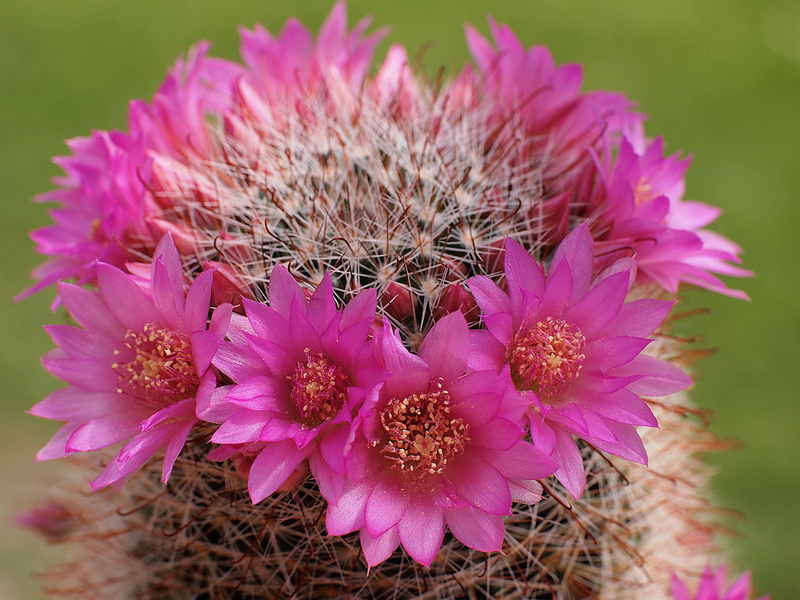 One of the most heavily flowering of all the Mammillaria, should be in every collection. Relatively easy to grow. To encourage better flowering, allow the plants to enjoy a cooling period in the winter without watering, cover from rain. 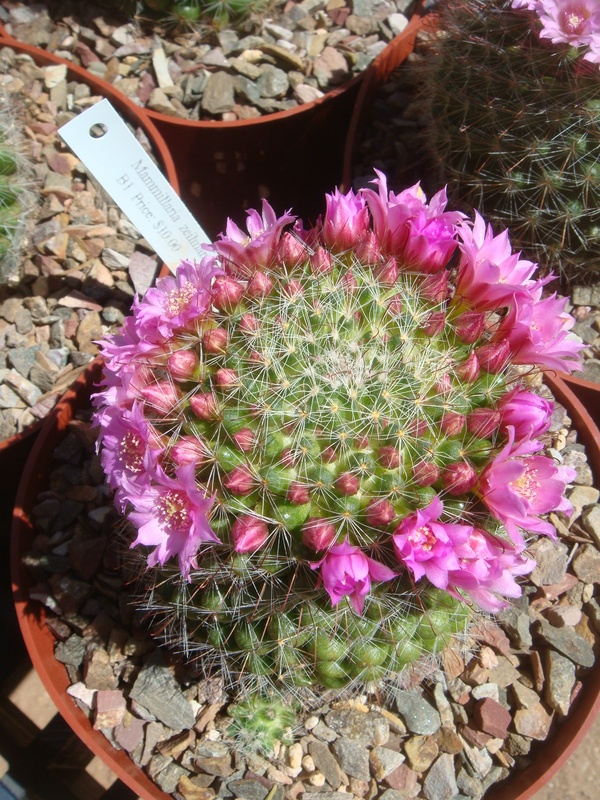 Unlike many other cacti, which use their ribs as storage devices, Mammillaria have raised tubercles, from which spines emerge. When watered, the tubercles will expand to allow for increased water storage. The flowers emerge from the axils of these tubercles on the previous year’s growth, which accounts for their interesting halo effect. Requires a very well draining medium. 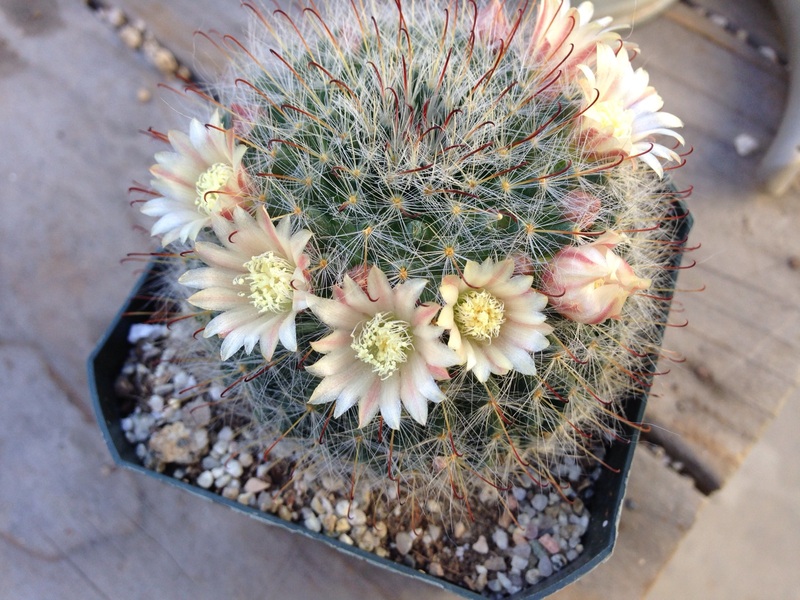 Benefits from repotting every 2-3 years, preferably during the warm season. Prefers bright light and good airflow. Outside it likes full sun with afternoon shade, inside it needs bright light, and some direct sun. Water well when it is dry to the touch. Restrict water in the winter as it is rot prone. Protect from frost, but hardy to -6°C (21°F) if kept dry. During the growing season feed with a fertilizer rich in potassium and phosphorous but poor in nitrogen which can make them too soft and full of water.